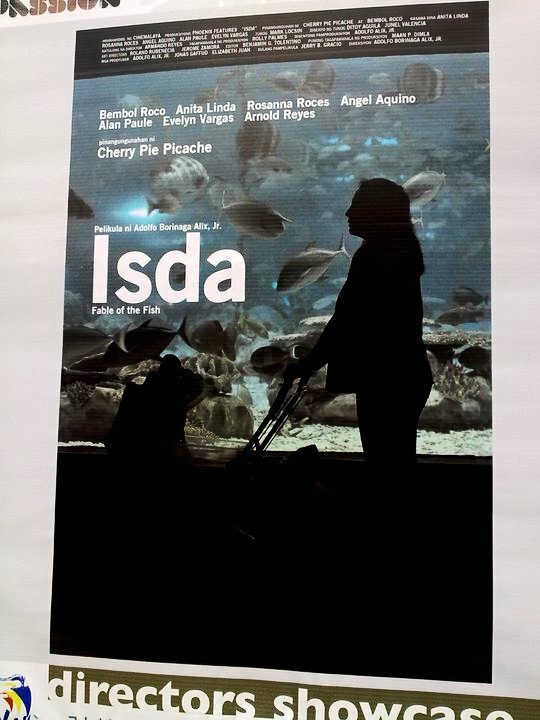 Isda is a full-length movie entry in Cinemalaya 2011 written by Jerry Gracio. It is one of the most unique story materials that have been crafted into a film. The story is about a poverty-stricken woman who gives birth to a fish. This poignant premise alone has been enough to jolt my interest to go to CCP’s Tanghalang Huseng Batute (Studio Theater) to watch it. According to the director Adolfo Alix Jr., who was present to answer few audience’s questions after the screening, it was inspired by the 80’s TV show Eye-To-Eye in which host Inday Badiday featured a woman who was said to have conceived and gave birth to a dalag (mudfish) in the midst of a raging super typhoon. Isda is an intriguing account that crumbles the barrier between true to life drama and the fight of imagination. I can consider this film as one of the greatest films of Philippine cinema. It’s rich, it’s multi-layered and it’s thought provoking. What I like most about the film is that it leaves the viewer to decide in what slant and perspective he wants the characters of the story to be perceived and takes the lesson/s out from it. I was very impressed with the delivery and portrayal of actors and actresses in the movie. Cherry Pie Picache in the lead role (of Lina, the mother of the fish) was so overwhelmingly effective she was able to reconcile the irreconcilable. Picache’s portrayal and attack on the role was serene and simple yet so real and undeviatingly precise. She was able to depict Lina’s character being a normal loving wife and mother without any tinge of being psychologically insane. I was actually made to believe that she truly gave birth to a fish and nurtured it. Bembol Rocco, who portrayed as Miguel (the father of the fish) was a class of his own. He was no doubt compelling. Though he uttered very few lines, Rocco exhibited the full intensity of his convincing characterization through his mere looks and gestures. Supporting actors and actresses in the film – Rosanna Roces, Anita Linda, Evelyn Vargas, Allan Paule and Arnold Reyes – were equally brilliant. Even the fish in the movie deserves an acting award! I am not a film authority but for me, Isda (Fable of the Fish) is a mixture of great elements of a motion picture: a unique and intriguing material; a distinctive director; and, an inimitable cast. It deserves all the awards and recognitions it will be bestowed with, may it be in the local or international film arena. Parang gusto ko kumain ng pinangat na tulingan.